Product prices and availability are accurate as of 2019-04-05 05:43:34 EDT and are subject to change. Any price and availability information displayed on http://www.amazon.com/ at the time of purchase will apply to the purchase of this product. 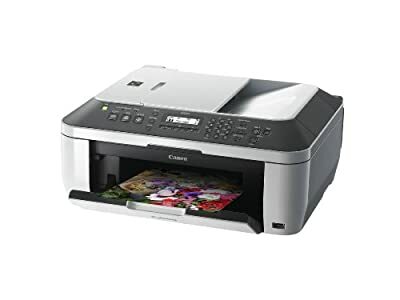 Get more projects done with this versatile Canon PIXMA MX320 All-in-One Office Printer!The feature-rich 5-in-1 PIXMA MX320 can print, copy, scan, fax and photo print with ease! A fully integrated 30-sheet Auto Document Feeder delivers fast copying, scanning and faxing of your originals so you can multi-task and increase your home office productivity! The Full Dot Matrix LCD helps to make things easier by showing printer and job status.Scan old photos and important documents with up to 1200 x 2400 optical resolution. A simple push of a button makes scanning a breeze! Making a copy is simple, too. Just push the button! With the PIXMA MX320 you can enlarge a copy up to 400% and reduce a copy up to 25%!Need to fax something fast? The PIXMA MX320 features Super G3 high-speed Fax and built-in memory to store up to 20 coded speed dials and 50 incoming pages. Dual Color Gamut Processing Technology optimizes your copy quality based on the original so your copies will maintain the integrity of the original.Don't feel like using a computer? No problem. Thanks to its PictBridge connection (cable not included) you can print photos directly from your digital camera, DV camcorder or camera phone! You can always use a computer and utilize the USB 2.0 connection, as well.With this versatile Canon PIXMA MX320 all-in-one in your office or home you can create projects and multitask with ease! Order today!